Lisa Armstrong’s class Gender, Land, and Food Movements (SWG230) worked in the SAL throughout the semester to update her previous class’s Story Maps on Gardening the Community (GTC), a community farming organization in the Four Corners area of Springfield. One of the Story Maps depicts GTC’s presence in the neighborhood – such as their gardening plots, their farmer’s markets, and their bike delivery routes. The other captures the school-to-prison pipeline in Springfield by visualizing the relationship between demographics, unemployment rates, and school discipline rates in Springfield. The students are also creating static maps that show GTC’s impact in the community for their website. The students in Modeling our World: Introduction to GIS (GEO/ENV150), taught by Jack Loveless, have been hard at work over the last few weeks producing Story Maps for local conservation non-profits. Their topics range from trail maps of natural areas in Northampton to an analysis of food deserts in Chicopee. In Michelle Joffroy’s first year seminar Tierra y Vida: Land and Ecological Imagination in US Latino/a Literature (FYS129), students have been working on a Story Map about the local group Casa Latina, which advocates for Latino/as in Hampshire County. Their final product will trace the evolution of Northampton’s Latino population since roughly 1960 and how Casa Latina’s caminatas, or marches, increase the visibility of this often overlooked population in Hampshire County. Another first year seminar using Story Maps is The World Water Crisis (FYS113) taught by Sarah Hines. They’re using Story Maps to examine different sources of water around the country and the conflicts and politics around them. 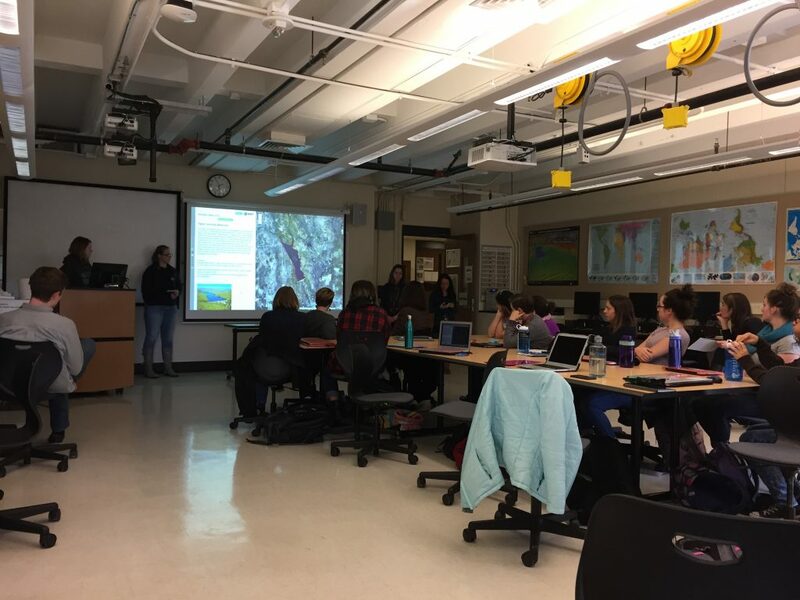 The SAL participated in Digital Effects (IDP160) for a second year, engaging students in a discussion on how our social lives are inscribed on digital maps with locative technologies. A guest lecture for Introduction to Landscape Studies (LSS105) began with one of favorite exercises; drawing a map of campus by hand. This simple exercise leads students to question what goes on a map and what is left off. A great beginning to a wide ranging conversation on cartography, the power of maps, and the rapid changes in mapping technology. We also introduced Story Maps to a new course in Landscape Studies, Visual Storytelling (LSS250). In Paul Wetzel’s Climate Change Concentration Capstone (ENX301), students partnered with Co-op Power, an organization in Greenfield that turns used vegetable oil into biodiesel. They mapped all of the restaurants in the Pioneer Valley, from Springfield to Greenfield, to help Co-op Power target new sources of vegetable oil and to maximize the efficiency of their pick-up routes. We also worked with several students doing an independent study with Paul Wetzel. Paul and his students are investigating the effects of restoring a diverted stream to its original stream bed at the MacLeish Research Station. 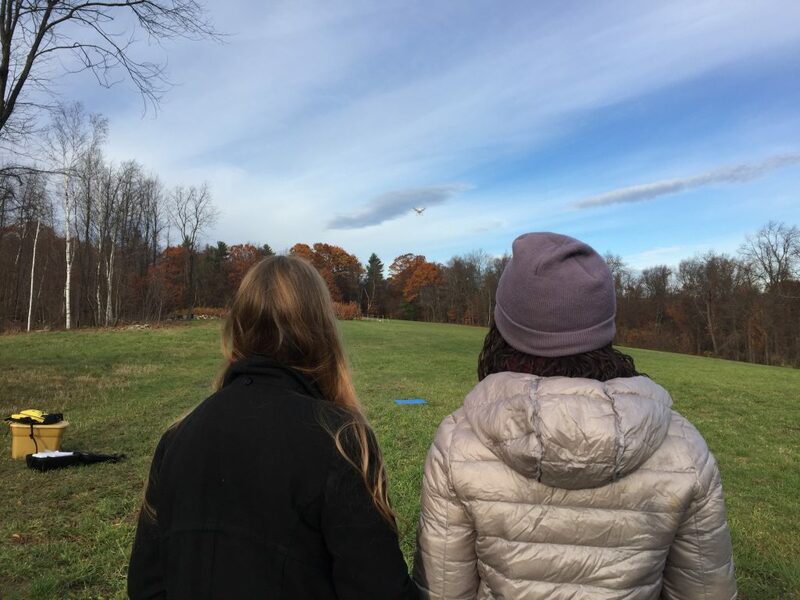 Towards the beginning of the semester, the SAL drone team flew several missions at MacLeish to provide the students with high-resolution aerial photos and digital surface models of the study area. Then, the students brought these data into ArcMap to graph elevation profiles of the current and old stream beds and to map the stream’s watershed. 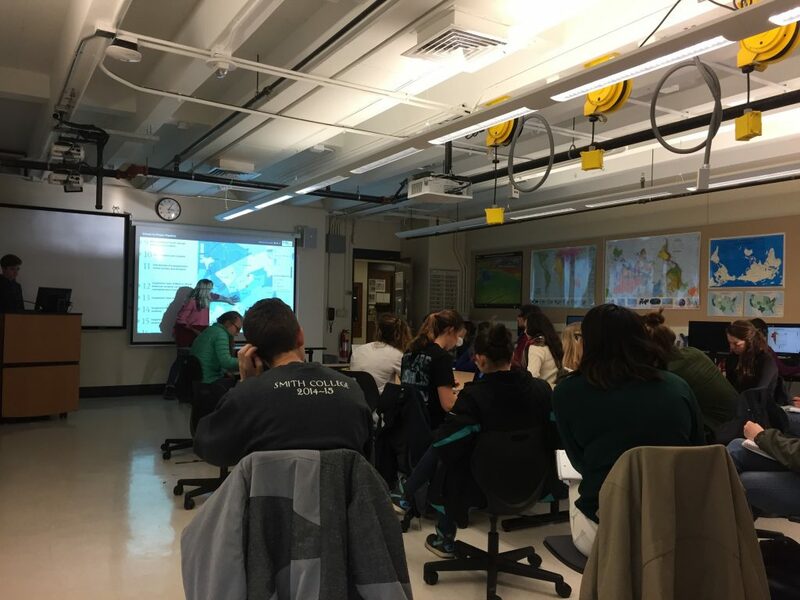 In Alex Barron’s Researching the Environment (ENV201-202), students took a first crack at GIS with a lab about lead exposure and toxic facility siting in low-income and high-minority areas of Holyoke. They then went out into the field to take soil samples at Grow Food Northampton and created maps of soil quality indicators to help the farmers understand recent productivity issues. Drone imagery of the nearly abandoned Belizean Estates in the mangrove swamps of Ambergris Caye, Belize. Finally, we worked with David Smith and two first-year students to analyze vegetation change in Belizean Estates, an area of Ambergris Caye, Belize, that was cleared for development nearly a decade ago but hasn’t attracted many residents. The two students are using a remote sensing technique called NDVI to understand the amount of mangrove swamp that was lost as a result of the development and how it has regrown (or not) in the years since. We worked with another of Prof. Smith’s students, Mandy Castro ’17, who is doing her thesis research on coral mounds in the Mexico Rocks reserve off Ambergris Caye, Belize. She is using 3D models of the mounds that we generated from drone imagery to measure the relationship between mound surface area and coral biodiversity. We finished developing the digital supplement to the Museum of Art’s When In Rome exhibition in late September, just before the gallery opened. We also had the opportunity to give a gallery talk in November about how historical maps like the Nolli map of Rome are being repurposed in digital media such as our Story Map. The exhibition is on view until December 30, so there is still time to check it out if you haven’t already! We’ve also continued our work on a blended learning curriculum that will be used in several classes with a GIS component. Last week, we finished recording videos for the first module on cartographic design. SAL Assistant Jenny Huang ’17 developed an interactive applet for the module over the course of this semester, and will work on another during J term. We aim to have the module ready for beta testing in our J term GIS class! Regular readers may remember that we’ve been involved with the Design Thinking Initiative and received a grant to use the principles of design thinking to improve GIS and cartography education at Smith. To that end, this semester Scott attended the annual NACIS conference to learn more about different approaches to cartography. SAL Assistant Amanda Lavond ’18 has also been researching the connections between design thinking and cartographic design and will help us to create a workshop next semester that will integrate the two. Scott and Jon became certified Remote Pilots by passing a required knowledge test mandated by the Federal Aviation Administration (FAA). We are now fully enabled to train students and fly drones for teaching and research. And, speaking of research, our 2nd team of student flyers (Drone Team 2) is trained and ready to continue research in the Bahamas this January. Lyn Watts ’17 and Anny Sainville ’17 (Drone Team 2) will travel to San Salvador and Exuma, islands in the Bahamas, to capture aerial imagery to support ongoing research by members of the Geoscience Department. Perhaps even more surprising than the number of classes and projects we’re wrapping up is the number of plans we have for next semester. Stay tuned for what will prove to be another exciting spring in the SAL as we continue to share the power of maps!